Melissa is a bit obsessive about food. (Let's be real, it's a bit more than a bit.) For example: she carries with her a small, green notebook to record ideas of names and ingredients for the infamous #TBPPizzaSpecial. Recently, while visions of cranberry sauce and the perfect turkey danced in her head; her mind landed excitedly upon the idea of a "Thanksgiving Series" of pizza specials at The Burlington Place. Not your typical "throw-the-leftovers-on-the-crust" concept, but...well, see if you can follow: This year, the Thanksgiving special is the Muchas Gracias - a pizza built on top of a cranberry salsa for sauce, dollops of cream cheese, fresh red onion, fresh jalapeno and ground turkey. Future pizzas will be built using Arigoto, Danke, and Merci as their nominative inspiration. Fun, right? And whilst dreaming up the next five years worth of Thanksgiving Series Pizza Specials, Melissa was planning her own, booze-driven Thanksgiving meal. Having mastered both a Rumchata Cheesecake and Cabernet Blueberry-Cranberry sauce for last years "No-Parents, No-Rules" holiday extravaganza, the rest of the traditional dishes needed to undergo a boozing factor for Abode 212's first ever Thanksgiving meal (to be shared with Katie, Tom, [maybe Patty], Harland and Brenda). Having only limited opportunities to run to town for groceries, planning had to begin just over a month in advance. Food magazines from the previous three Novembers littered the living room floor, Pintrest was at the ready and consideration for food traditions loved and loathed was at the forefront of the decisions to be made. This meant, that Melissa took into consideration facts like her folks are non-sweet potato eaters, and Mike will always pass on the green bean casserole and traditional pumpkin pie, so why work hard to incorporate those as main dishes? To be expected of a girl who prepared her first, full-on turkey dinner her senior year of high school (for the pure joy and experience of it all), Melissa felt no intimidation at seeking out new dishes, new methods of preparing a turkey and new ways to incorporate all the classics (sweet potatoes will find their way into the hummus this year, served on the relish tray as opposed to alongside the stuffing and a mushroom barley salad will fill the gap for the green bean casserole). The menu began to take shape with boozy concepts taking a firm hold on most menu items- Melissa was struck by recipes for a bourbon brined turkey and a hard cider brined turkey (therefore, it should be no surprise she combined both concepts and had a hard-cider-bourbon-brined turkey to serve). As the turkey brine began to take shape in mental format, cooking the bird became the next matter of interest. Having a small kitchen and one small oven and NOT wanting to run down to The Burlington Place to take care of various parts of the meal, Melissa began her research on using an electric roaster oven to prepare a turkey (conveniently, an electric roaster came with the purchase of The Burlington Place, so Melissa owns one by association). Many bloggers and roaster experts had high praises to sing of their turkey's prepared in an electric roaster, claiming it was quicker, resulted in a juicier turkey and most importantly freed up oven space, Melissa was convinced and brought home the roaster to be cleaned and used on the big day. While, some parts of the meal had been decided a year in advance: the Cabernet Blueberry-Cranberry sauce and Rumchata Cheesecake; the rest had to be decided upon in time for the bi-weekly grocery run. 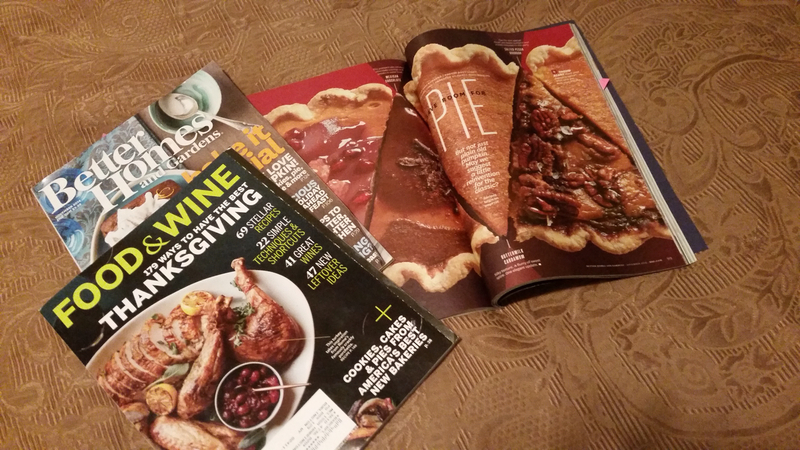 As such, from the piles of magazines a Mushroom Barley Salad (courtesy of Food & Wine), Lemon-Rosemary Rolls (courtesy of Better Homes & Gardens), and a Salted Pecan-Bourbon Pumpkin Pie (also courtesy of Better Homes & Gardens) made it onto this years menu. Additionally, a sweet-potato hummus and roasted chickpea appetizer (each courtesy of Pinterest) made it onto the snack cart. Brenda and Katie rounded out the holiday meal with twice-baked potatoes and lemon-butter green beans respectively. Other, aesthetic details that came together in the preparation stage of planning the meal included the purchase of white linen napkins complete with paper-leaf napkin rings (an homage to Mike's grandma Carolynn who believed in the power and purpose of a well-set dinner table, no matter the occassion). Melissa also purchased a sturdy, folding bar cart to use as the brunch and snack station to be located in the living room so guests could easily snack without getting congested in the small kitchen of Abode 212. (Brilliant!) Melissa also repurposed her old, OLD, dorm fridge for a convenient, dining room drink station, another trick to avoid the congestion of the kitchen. 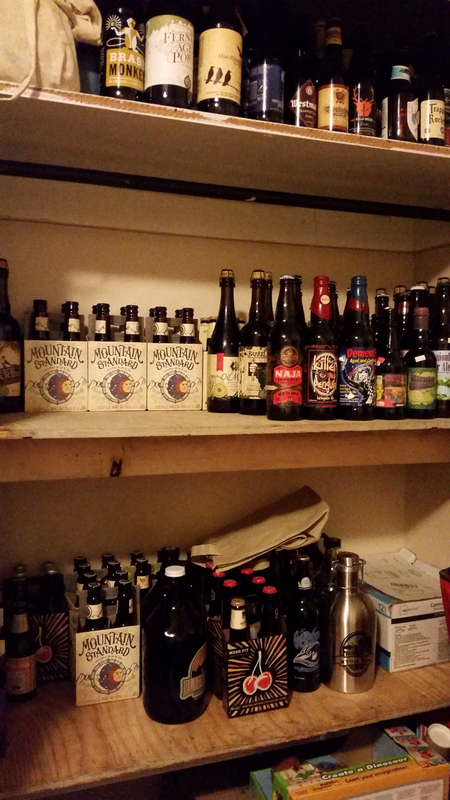 Additionally, Mike conquered the building of shelves in one guest room so that boxes of beer (just a small collection that the Harrington's have been building for a few years now) could be better organized and less obtrusive in the small room. Mike also added small hooks to the back of both guest rooms for robes and towels (now that guests have the opportunity to soak in a hot tub). In the life of Melissa Harrington, preparing for guests and big meals is just one of lifes great joys, the actual hosting obviously trumps the whole process, but the immensity of joy to be experienced in the whole of the event is truly life-giving. The small details, the big details, the menu plan, the cleaning tasks - all played into the execution of a most enjoyable, incredibly delicious Thanksgiving holiday.